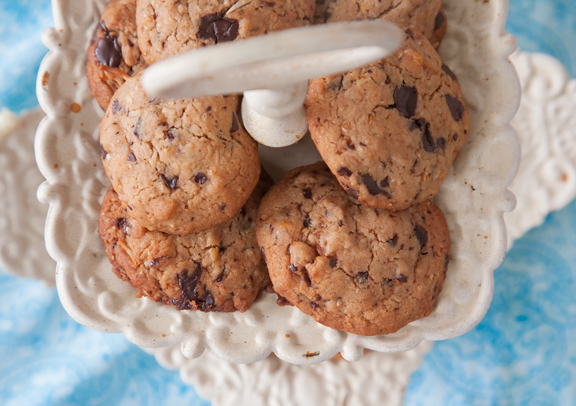 Everyone loves a choc chip bikkie, or cookie, or whatever you want to call it. Tragically, the supermarket ones are super loaded with fat and sugar (which is why they’re yummy) so it’s hard to justifiably eat many…..not so with these little darlings. If you want a biscuit with absolutely no fat or sugar, eat some cardboard, or better still, an apple, but if you want a healthy version of this yummy treat, look no further. 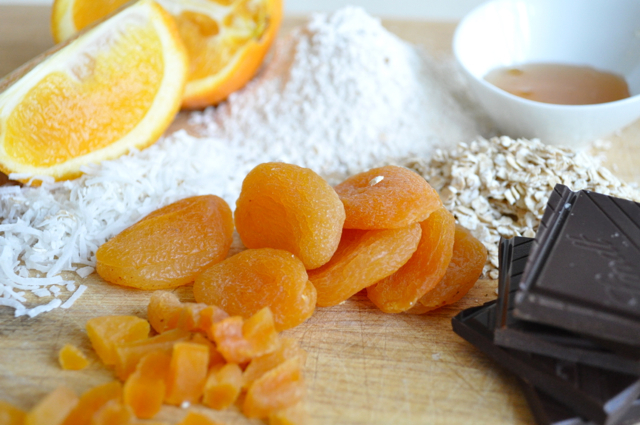 These are low GI, high fibre, a little dried fruit and a little dark chocolate. As we all know, dark chocolate is an antioxidant and helps to release happy hormones. So, use a little in the biscuits for your kids and eat the rest of the block for an afternoon buzz. Or just cut to the chase and eat these with a glass of wine. I often find ‘healthy’ treats taste like tricked up horse food and leave me wishing I’d just reached for the damn Tim Tam in the first place…..alas, no so with these. These actually hit the biscuit spot. The trick is half/half wholemeal and plain flour. If you don’t have self-raising, remember it’s just 2 teaspoon baking powder to 1 cup flour. If you think you don’t have time for this, trust me, you do. 5 minutes mixing, 10 minutes resting (cup of tea???) and 15 minutes in the oven. 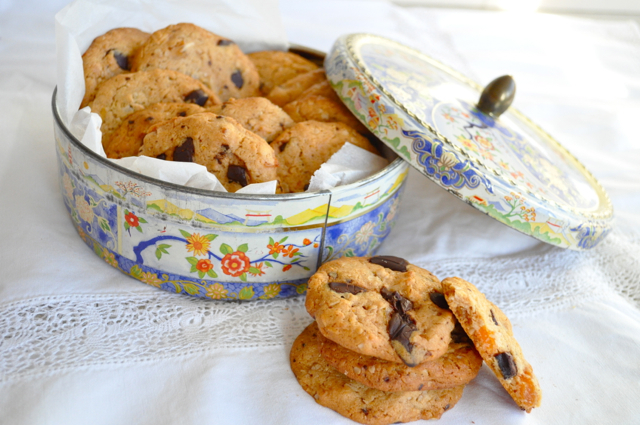 Badda boom, you got yo’self some healthy choc chip biscuits. Put oven onto 170C fan forced (180C if not). Mix your dry ingredients into a bowl. Into a sperate bowl place all of your wet ingredients and stir well. Add to dry ingredients and leave it to infuse and rest for ten or so minutes. Using a tablespoon and moist hands roll into 18 balls and place onto a tray lined with baking paper. They will spread so give your babies some room. Gently press them with the back of the spoon (I use my thumb, usually well licked. Don’t share my biscuits if it bothers you). Pop them into the oven for 15 mins or until golden. If you liked this post be sure to like my Facebook page or follow me on twitter @theholsbys…. maybe we could cut to the chase and you should subscribe to the blog via email so you can always keep up with the Holsbys!! Strawberry Mini-Cheesecakes…….sadly, not delivered by my neighbour. Yum! So I just made these but didn’t have apricots so used sultanas and dried apple. Also didn’t have wholemeal flour so used white and threw in some LSA to healthy it up. My Lindt is 85%, not 70% and my oil was plain old vegetable. So really only semi the same as yours but they turned out delicious! In case anyone was wondering they can also be made while a toddler screams “Hurry, Mummy, hurry!” since you told her there would soon be cookies and a 4 month old sleeps in the bjorn on your chest. Perfect, I love a bit of cowboy recipe following!! Keeping the basic principles and make it fit your pantry, that’s the only way to fly…. 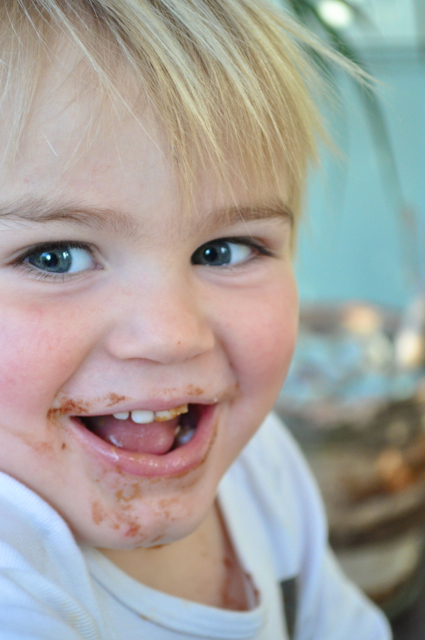 hope Alice gets chocolate all over her face (you too, Mama!). What an awesome comment…you just made my day! Ha, you’ve made all these baker’s dreams come true! LOVE! Hi. These look lovely! Can I freeze them? They e never lasted that long around here!! I’d freeze dough but not once cooked.